This article is about signal conditioning to prevent reflections. For other uses, see Termination. Electrical termination is an electrical industry term used to describe the specific point at which a conductive device, such as wire or cable, ends or starts. The conductive device may or may not pass the carried electricity or signal onto another conductive device at this point. A common point of electrical termination is at a terminal block. A wire typically ends, or terminates, at the terminal block; but the electricity or signal may be passed onto the terminal connectors. 10BASE2 cable end signal terminator. Signal termination is a very different type of termination which often requires the installation of a special device, known as a terminator, at the end of a wire or cable to prevent an RF signal from being reflected back from the end, causing interference. The terminator is placed at the end of a transmission line or daisy chain bus (such as in SCSI), designed to match AC impedance and hence minimize signal reflections. Passive terminators consist of a simple resistor. Limited usage for high-speed applications. There are two types: a resistor between signal and ground like in Ethernet, or a resistor from the positive rail to signal and a resistor from the signal to negative rail like in SCSI. Active terminators consist of a voltage regulator that keeps the voltage used for the terminating resistor(s) at a constant level. Forced Perfect Termination can be used on single ended buses where diodes remove over and undershoot conditions. The signal is locked between two actively regulated voltage levels, which results in superior performance over a standard active terminator. All parallel SCSI units use terminators. 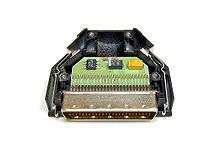 SCSI is primarily used for storage and backup. Controller area network, commonly known as CAN Bus, uses terminators consisting of a 120 ohm resistor. Dummy loads are commonly used in HF to EHF frequency circuits. 10BASE2 networks absolutely must have proper termination with a 50 ohm BNC terminator. If the bus network is not properly terminated, too much power will be reflected, causing all of the computers on the bus to lose network connectivity. 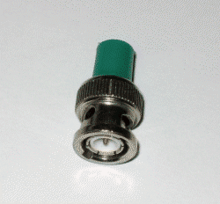 A terminating resistor for a television coaxial cable is often in the form of a cap, threaded to screw onto an F connector. Antenna cables are sometimes used for internet connections; however RG-6 should not be used for 10BASE2 (which should use RG-58) as the impedance mismatch can cause phasing problems with the baseband signal. Unibus terminator/bootstrap card from a PDP-11/34. The Digital Equipment Corporation minicomputer Unibus systems used terminator cards with 178 Ω pullup resistors on the multi-drop address and data lines, and 383 Ω on the single-drop signal lines. Terminating resistors values of 78.7 ohms 2 watt 1% are used on the MIL-STD-1553 bus. At the two ends of the bus, resistors connect between the positive (high) and negative (low) signal wires either in internally terminated bus couplers or external connectorized terminators. The MIL-STD-1553B bus must be terminated at both ends to minimize the effects of signal reflections that can cause waveform distortion and disruption or intermittent communications failures. Optionally, a high-impedance terminator (1000 to 3000 ohms) may be used in vehicle applications to simulate a future load from an unspecified device. Connectorized terminators are available with or without safety chains. ↑ Holt, Mike. "Splices and Terminations of Conductors". ecmweb.com. Electrical Construction & Maintenance. Retrieved 19 June 2016. ↑ Digital Equipment Corporation (1979). "Unibus Specification" (PDF).